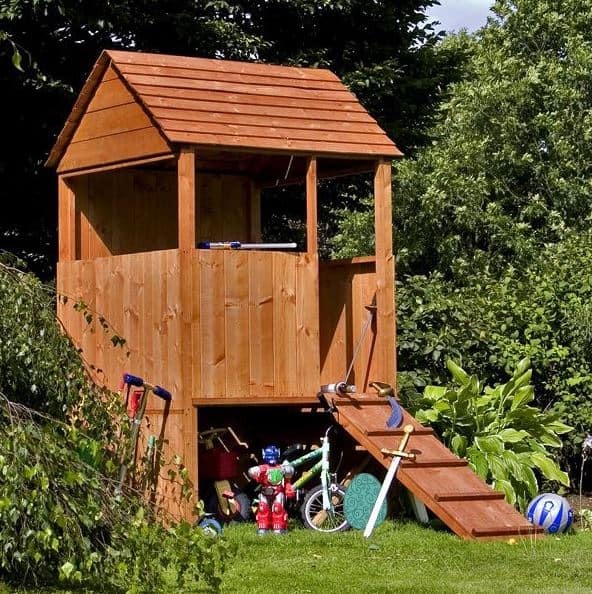 The 4 x 4 Waltons Honeypot Stockade Tower Outdoor Boys Playhouse is a dream for kids who love to run around the garden and pretend that things like bushes, sheds and even boxes are some kind of base. Well now they no longer need to pretend as they can have this as an actual base to hide, plan their games and in general just have an awesome time. Hours of fun will be spent playing inside, around and even underneath this fantastic tower playhouse. One of the most notable features is the ladder or perhaps ramp is a better word. This is a low ladder with safety rungs so that the kids can just run up and down it. 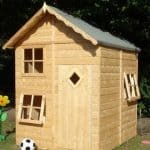 As this is a playhouse that is made for boys who like to play rough it has been designed with some very heavy duty and high quality materials. 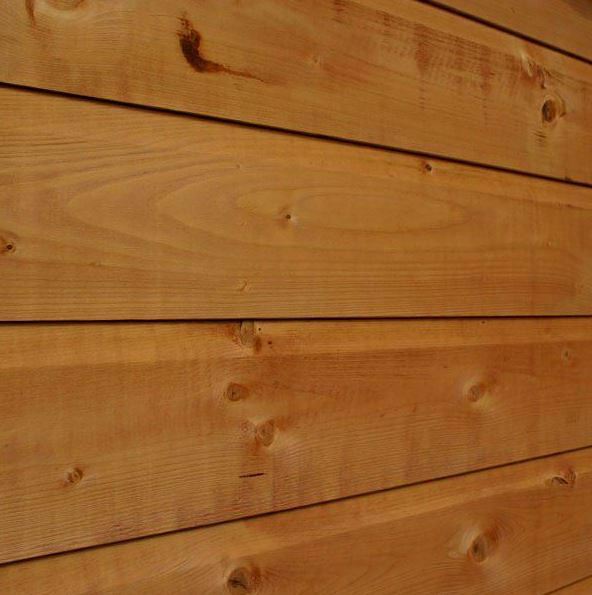 The walls are very strong and they also look great as they are 12 mm thick tongue and groove shiplap cladding. Behind this is a frame which is going to be able to take all kinds of wrestling and jumping around. One very surprising part of this is the roof which rather than be covered with felt is covered with some very nice looking, overlap cladding. While this is called the 4 x 4 Waltons Honeypot Stockade Tower Outdoor Boys Playhouse, we are sure that little girls could also have fun with this, but there is no denying that this was made with little boys pretending to be Spider-Man and hiding underneath it like they are a Ninja Turtle in mind. This is something that kids are going to have all kinds of fun with. While the fun aspect is of course the main selling point, you will be pleased to know that at, 4 feet wide and 4 feet deep that this does not take up a whole lot of space in the garden. 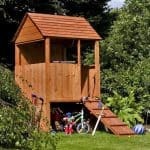 As this is a tower playhouse it is quite high with the ground of the playhouse being, 2 feet 2 inches off the floor and at the very top of the roof the playhouse stands at an impressive, 7 feet 8 inches high. We want to take a moment here to specifically talk about the shallow ladder that is on here. This has been made so that kids can be running around the garden and then just runs straight up this without breaking their stride. To ensure there is very little chance of them slipping, Waltons have cleverly placed safety rungs on the ladder. The roof was something that really did take us by surprise. We are so used to seeing felt on roofs that the overlap cladding roof really did impress us. It gives the playhouse the look of some kind of fort that little boys are just going to love. It is also very strong at, 7 mm thick. 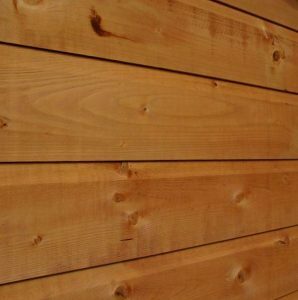 The walls are made with 12 mm tongue and groove shiplap cladding. One thing that we love about this is how the cladding is vertical, we are not sure if this was intentional on Waltons part, but it does make this look higher than it actually is. The wood has been taken care of so that it is nice and smooth and will not give the kids splinters. 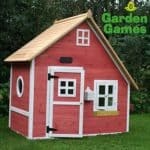 If you look at some of the pictures you can clearly see just how good the frame used on this tower playhouse is. This is one solid frame that is going to be able to take the overly rough play that boys love to do. As one part of the playhouse goes all the way down to the floor, we can only imagine kids are going to be slamming into this, kicking a ball of it and probably throwing things at it also, well the strong frame allows them to do this and a whole lot more fun stuff to it. Boys will be jumping around, fighting and doing all other kind of fun things in here so that is why, Waltons have used 12 mm tongue and groove boards for the floor. You can see from the pictures just how strong this floor is and we are sure it is going to be more than up to the task of taking the abuse the kids give it. We can only imagine how filthy and muddy this playhouse is going to be after a couple of weeks of fun play. But before that it will look fantastic and that is because you are going to have to give it a coating of wood treatment so the wood will not rot. We always suggest that you do this once it has been built and then give it another coat 12 months down the line. 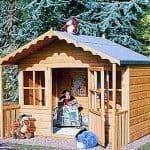 As of us writing this review, Waltons are giving you a free 5 litre tub of golden brown wood treatment with this playhouse. 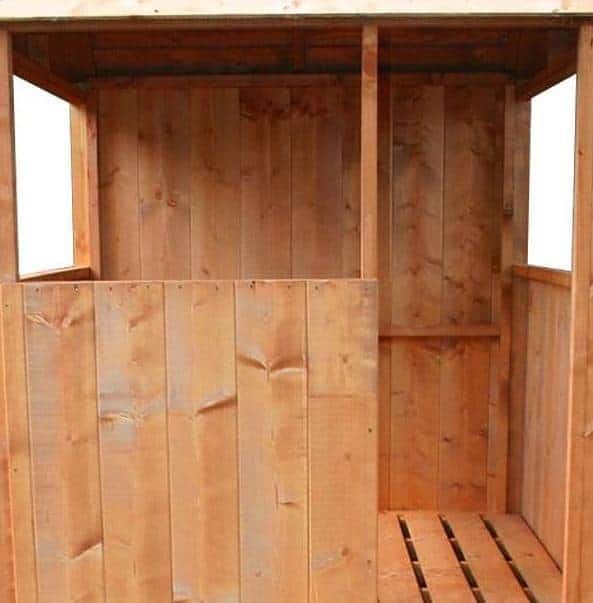 The 4 x 4 Waltons Honeypot Stockade Tower Outdoor Boys Playhouse comes with a ten year anti rot guarantee. For this to be valid, you must have given the shed a coating of wood treatment. As you can see there is no door on this playhouse and that actually is not a bad thing. The idea of this is that kids can just run straight up into the playhouse and a door would just get in the way. So if they are playing a game of tag, super heroes or even hide and seek there is no fumbling around with a door for them to get inside here. There are no windows included with this playhouse, but again this is part of the design there are open areas for them to look out, but no styrene or glass to get in the way. The only thing you have to watch for is the kids jumping off this, which let’s face it they will surely want to do! This is one very robust and secure playhouse, but it is entirely open so you will not want them leaving their expensive toys inside of here. 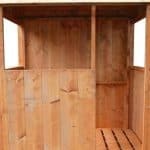 Now you may think that there is no privacy at all with this playhouse, but that is because you are looking at it through the eyes of an adult. To a kid they can duck behind the walls, hide underneath and even hide right behind it. So for a kid there is a whole lot of places for them to hide and keep out of sight. Just be sure when you are shouting them in for dinner to look round the back of it if you cannot find them. We feel that this is ideal just as it is and so do Waltons as they do not offer any customisation options with this. This is pretty much an all in one playhouse and there are no extras at all for you to think about. The only thing that is offered is an installation service, that is £109.99. As this is made for boys, you can rest assure that the materials used are very high quality and incredibly robust. We know that 4 x 4 may not sound large, but for a kid this is fine, plus there is the space underneath and the way they can hide behind it as well. This is a fairly straightforward DIY project and with the help of a friend should take 4-6 hours. We feel that this really is excellent value for money. At under £300 the kids are going to get many years enjoyment out of this. 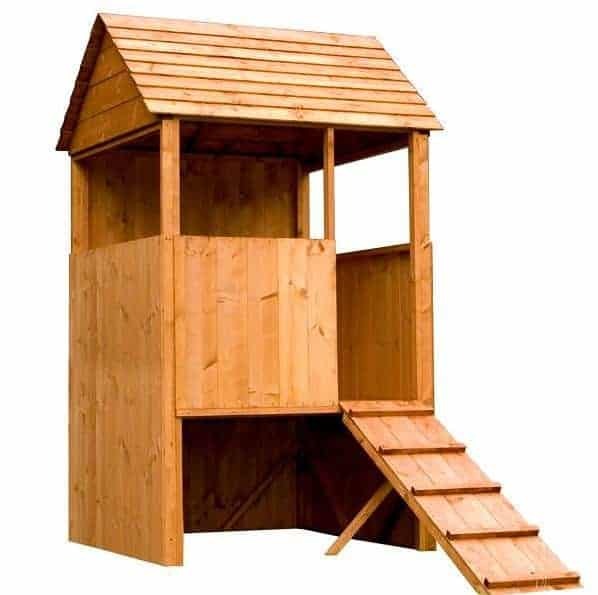 Final Thoughts: Boys and even girls are going to have a whole lot of fun with the 4 x 4 Waltons Honeypot Stockade Tower Outdoor Boys Playhouse. While to many adults we are sure this is going to look like a very barebones kind of playhouse, but to a kid there is just so many possibilities and hours of endless fun to be had with this. 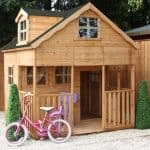 The playhouse is very well made and it has actually passed numerous child safety tests and we have no doubts about its longevity at all. 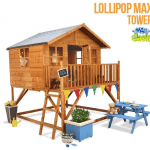 For £269.95, we feel that this really is one incredibly priced playhouse and if you do have kids who just want to run around like maniacs and have a little space they can call their own then this would be a great buy.